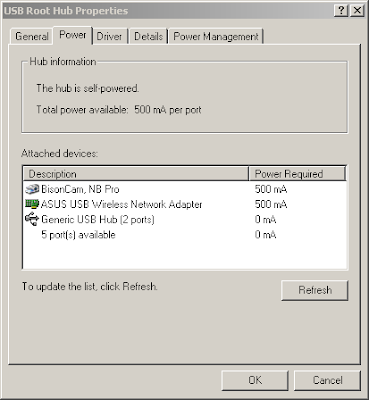 Just found this tip on the Asus support forums from Helmuth, Germany, on how to disable the power management for the USB hub where the wireless chip is connected to. Give it a try and see if it makes any difference for you. 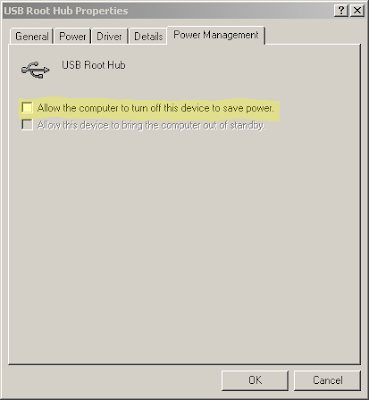 Open Computer Management console (Run -> compmgmt.msc), go to Device Manager, expand Universal Serial Bus controllers, go to the last USB Root Hub entry and double click it (Properties). Hey Dan, I've tried that before and it really didn't do anything for me. I just installed Vista and so far the wireless has been much better. I haven't noticed the same problems I had before with the weak signal strengths. Thanks for posting back - did Vista have it's own driver? which version have you installed? I plan to install maybe RC2 soon, any tips on installing Vista are much appreciated. If I am correct Vista doesn't support shrinking your 1024x600 down onto the 7" screen. At least not at the moment. But the wifi-woes fix may out weigh it. Dan, did you know that the latest video drivers didn't support rotation? At least not on my machine. I updated the drives to the latest intel drivers then when I started using my R2H a bit more with readers and InfoPen Notes, i realized that it would be great to rotate the screen. Going through the options with the latest drivers, I noticed a HotKey to orient the screen upright, but no options to rotate the screen. Searching further, I came upon URotate which only flashes the screen when I hit the rotate buttons but doesn't change the orientation. I've reverted back to the previous drivers (Rollback) which supports the rotate features and supports URotate. So, if you are to do any type of reading or note taking, I do suggest using the drivers that came with the unit. The only problem I saw was that it doesn't support high resolution mode when oriented away from upright mode. Thanks for your findings - I assume you're still talking about Vista, is that correct? Freezing - I think this might have to do with the r2h wireless driver, but the OS freezes occasionally when I have the toshiba vista bluetooth stack installed. It freezes on bootup. Also, if I disconnect the ethernet, it freezes the system. A reboot seems to solve this or if I'm going to disconnect the ethernet, I disable the ethernet driver first. Windows mobility center doesn't list brightness controls, wireless, etc. Sorry about that, confused between your comments and Alexander's. I think most of the Asus utilities/drivers for XP won't work for Vista. I believe the hardware keys (hold, wireless etc) are controlled on XP by an application called HCONTROL.EXE, which I believe it may be part of the ATK100 package, which is only available for XP. I haven't seen anything about Vista on R2H support site. I belive the Ethernet is controlled by the BIOS, where if it's disconnect it will disable and hide it from Windows - I've seen this in XP, maybe that's what's causing the freeze you're talking about. Wireless lights at the bottom are controled by another application, that I managed to remove on mine, and now the lights are not shown to me either - not that it bothers me anyway. I think it's the same application that shows the bouncy icons when you push the wireless switch button. You could post your problems on Asus website using the Technical Inquiry, then you'll get either a fix or at least Asus Support will be aware that people have started using Vista and hopefully they will publish the drivers and utilities for running Vista.